Riverside Park is located at the corner of Adelaide Street and Crystal Ave. The park can be entered from Adelaide at the south end, and from Riverside Heights at the north. Free parking is available. From downtown New London: Take Water St to Crystal Ave, and turn right. Continue about .5 miles, then turn right onto Adelaide. The entrance to the park is on your left. From I-95S: Take exit 84S-N-E and follow both forks to the right. Merge onto Williams St, follow for .2 miles and turn left onto Cole St. Turn left onto Adelaide. Riverside Park will be on your left. From I-95N: Take exit 83. Turn left onto Williams St, then take a right onto Cole Street. Turn left onto Adelaide. Riverside Park will be on your left. If you would like to use the park for a special event, contact the New London Recreation Department. 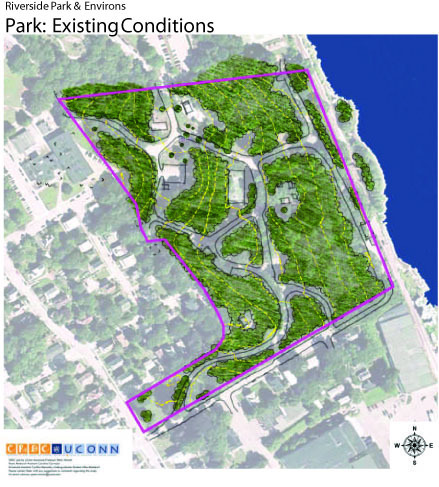 All requests to use the parks within the City of New London need to be brought before the Parks & Recreation Commission for approval. Meetings are the first Wednesday of each month at the Senior Center Library at 6:30pm. Any agency, organization or individual needs to, once approved, submit and receive a facility request permit from the Recreation Department. COPYRIGHT © 2012 RIVERSIDEPARKCONSERVANCY.ORG. ALL RIGHTS RESERVED. DESIGN BY FREE CSS TEMPLATES.